Almost everyone needs an accountant: individuals, businesses, and organizations, whether in the public, private or nonprofit sectors. Honest accounting is essential for corporate and government oversight—the flipside can lead to audits, investigations by the Securities and Exchange Commission, and public distrust, which can shut businesses down for good. If helping businesses uphold their accounting goals is something you want to explore, an online associate degree in accounting is a great way to get started. It requires the lowest amount of financial and time commitment, allowing you the flexibility required to maintain work and family responsibilities. Due to the high demand for accountants, studying accounting offers great entry-level job opportunities. However, most students pursue a 4-year bachelor’s degree and eventually a master’s degree, allowing them to become Certified Public Accountants, which offers a substantial pay increase. While your online associate degree in accounting is great for starting your studies, keep in mind that you may want to further your education to increase your job opportunities and salary potential. 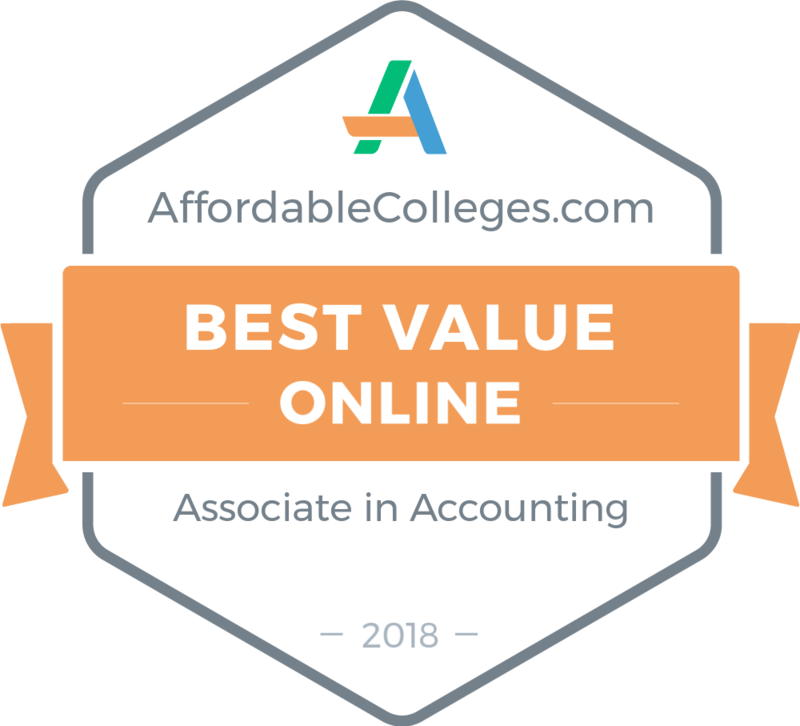 We ranked the most affordable online accounting associate degree programs to help you explore the field and determine if it’s right for you. Located in Statesboro, Georgia, Ogeechee Technical College was founded in 1986 as a school for practical nursing classes. Its first class consisted of only 25 students. Since then, OTC has seen expansive growth and today offers a comprehensive list of certificate and degree programs, many of which are accessible to distance learners, including an associate of applied science in accounting. Emphasizing a combination of theory and practical application as well as the use of both computerized and manual financial systems, OTC’s accounting associate degree online program prepares students for education at the university level or for entry-level work as bookkeepers, office managers, and tax specialists, among other positions. The degree program totals 64 credit hours and includes a combination of general core and major classes in economics, business communications, and computer applications. Students may also use a number of elective courses to personalize their degree. OTC offers an affordable tuition rate and makes available a number of privately-funded institutional scholarships. Western Wyoming Community College, located in Rock Springs, offers a number of two-year degree and certificate programs in the fields of business and industry. Designed to provide students with the skills they need to work with financial information at many levels within an organization, WWCC’s associate degree in accounting online prepares learners for jobs immediately upon graduation or professional designation exams, such as the CMA, CIA, and CPA. The curriculum, which totals 64 credit hours, also dovetails into many bachelor of science in accounting degrees, enabling students to seamlessly transition into a university education. Courses include managerial finance, business calculus, and introduction to information management, among other topics, and though the four-semester degree plan is presented in a particular sequence, students do not need to follow that exact track -- they can work with their adviser to personalize their associate of science experience. Though the school prices tuition differently for Wyoming residents, those in the Western Undergraduate Exchange program, and other out-of-state students, cost remains notably affordable. Located in Norfolk, Nebraska, Northeast Community College was established in 1973 by the state legislature and offers vocational/technical, liberal arts, and a host of other academic programs. NCC also boasts a number of distance learning degrees, including an associate of arts in accounting that teaches students the latest principles in accounting and how to apply these skills to real-life workplace challenges. A minimum of 60 credit hours is needed to graduate, 27 of which are completed in the major core with courses like business statistics, spreadsheet accounting, and topics in law and ethics. Note that not all courses are offered online every semester, so students will need to consult with their academic adviser to create the degree plan that best works for them. NCC’s tuition rate is remarkably cheap for both state and out-of-state students, making it one of the most affordable online colleges for associate degree in accounting available in the United States. The University of Alaska Fairbanks traces its history back to 1915, when it opened its doors as a school for mining and agriculture. Today UAF is a comprehensive institution, offering a wide variety of academic programs, many of which are facilitated through eLearning and distance education platforms. Among this catalog is an online associates degree in accounting that combines accounting and related business classes to prepare students for entry or mid-level positions as bookkeepers and payroll specialists, among other career options. This associate of applied science curriculum totals 60 credit hours and remarkable course topics include customer service, the fundamentals of supervision, and microcomputer accounting. Students also complete a capstone course, designed to encapsulate all the skills they’ve learned, especially useful for those who want to pursue a four-year degree. Furthermore, UAF students have the option to complete an accounting technician certificate and a bookkeeping occupational endorsement as part of their degree work. Residents of Alaska and out-of-state students pay the same affordable tuition rate. Lenoir Community College is located in Kinston, North Carolina and offers 134 degree, diploma, and certificate programs, some of which may be completed entirely through the school’s online platform, Moodle. One of these options is an associate of applied science in accounting degree, which teaches students to collate, analyze, and communicate important financial information related to a business’s or organization’s daily operations and growth. The degree plan totals 66 credit hours and students usually earn their degree in four semesters. In addition to general education requirements and coursework in accounting principles and practices, students also develop related skills in critical thinking, financial ethics, computer technology, and much more. While the school's tuition rate is low overall, it's especially cheap for North Carolina residents. In terms of affordability, this makes LCC one of the best online associate in accounting programs in the country. LCC is not authorized to offer online courses to all states, so students should check with their distance education agency to ensure that they can enroll in this degree program. Located in Scottsbluff, Western Nebraska Community College places an emphasis on providing quality and accessible education, public service, and support for all of its students, especially those in underserved populations. To this end, WNCC offers a number of distance education programs, including two options for an online associates degree in accounting: an associate of arts and an associates of science in business administration. Both degrees contain courses in topics like financial accounting, business communications, and spreadsheet and other computer applications. Having two options provides flexibility, allowing students to personalize their education according to the goals and whether they want to focus on humanities/social science or math/science, respectively. Generally speaking, an AS degree prepares students for specific job opportunities immediately upon graduation, while an AA offers more curricular freedom and is especially suited for those who want to transfer into a related bachelor’s. WNCC offers an affordable tuition rate to all students, regardless of residency status. Offering over 140 two-year degree and certificate programs (eight of which can be completed remotely), Casper College is one of the most comprehensive community colleges in Wyoming. The school's associate of business in accounting is designed specifically for students who want to pursue bachelor’s degrees in the field. Students take 32 credits in general education requirements and fill out the remainder of their degree plan (28 credits or more) in major courses like principles of microeconomics, business law, and introduction to information management, among other related fields. In order to qualify for this online associates degree in accounting, students must choose six credits of intermediate accounting in their sophomore year. Coursework in accounting emphasizes hands-on learning and students can expect to study financial statements and other work documents in detail to gain theoretical understanding in the context of practical application. The school's affordable tuition rate is priced based on residency status and the school makes a number of scholarships available, including foundation and institutional awards. Located in the north Georgia city of Oakwood, Lanier Technical College provides technical and adult education that meets the workplace development needs of the institution's surrounding communities, including the city of Gainesville. LTC offers a number of distance learning academic programs, including an online associates degree in accounting. The program provides students with training in areas like account classifications, payroll, fundamentals of database and spreadsheets, and, of course, various forms of accounting practices and theories using both manual and computer-based systems. In addition to general education and core requirements, students also have a number of accounting and free electives to use towards degree personalization. The curriculum totals 64 credit hours and students usually finish in five semesters, though the school provides options to increase workload and complete the degree in less time. Consult an academic advisor for more details. Tuition price is based on a student’s residency status. All Georgia citizens over the age of 62 may take courses for free. Based in Elko, Nevada, Great Basin College offers two and four-year academic degrees in a number of career/technical and academic areas, enrolling approximately 3,800 students in its distance education program. Available program options include the school's associate of applied science in business administration with an accounting emphasis. This degree prepares students for entry and mid-level work upon graduation, teaching them to create and maintain reports and other documents that help businesses track growth and plan for the future. Students may also use this online associates degree in accounting as a springboard for further education, either through professional accreditation or a four-year degree. Totaling a minimum of 60.5 credit hours, program course topics include general education areas such as social science and the humanities as well as program emphasis classes in taxation for individuals and microcomputer accounting systems, to name some examples. The program features affordable tuition priced by residency status. Students may elect to pay for full-time enrollment or per credit if part-time. Founded in 1957, Williston State College offers two-year degrees in over 70 areas, and, for students looking to take their degree to the next level, the school partners with institutions in the North Dakota University System to ensure a seamless transition for into bachelor’s programs. WSC administers an established distance education program and offers an online associates degree in accounting that prepares students for a career at any business, organization, or financial institution. By developing critical thinking and problem solving skills in conjunction with knowledge of accounting principles and practices, graduates not only have the ability to prepare and maintain important documents but they can also assist with business planning and management control. In order to earn this associate of applied science degree, students must complete a minimum of 62 credit hours in courses like cost accounting, income tax procedures, and spreadsheet application. All distance learners enjoy the same affordable tuition rate and the school makes various forms of financial assistance available, including a generous institutional merit scholarship. Located in Perkinston, Mississippi Gulf Coast Community College was founded as an agricultural high school in 1912. Today MGCCC is one of the top two-year degree producers in the region and offers several academic programs for distance learners, including an associate of applied science with an accounting technology concentration. Students complete 61 to 62 credit hours in general education areas like English composition, fine arts, and a variety of core business topics. True to its name, this online associates degree in accounting program emphasizes technological skills, ranging from word processing to microcomputer applications. The curriculum is tailored to the needs of students who wish to gain entry-level employment as, for example, bookkeepers or financial specialists after graduation. Those who want to pursue a bachelor’s degree are still welcome to enroll, altering their degree plan under the advisement of an academic counselor. All distance learners receive the same affordable tuition rate and out-of-state and international students pay an additional fee each semester. Located in Goldsboro, North Carolina, Wayne Community College was founded in 1960 as a night school for part-time students seeking vocational and technical training. Today WCC offers over 100 academic programs for full-time nontraditional students, including an online associates degree in accounting. By instilling theoretical principles in the field and producing practical skills through application, the program prepares graduates for accounting positions in tax firms, banks, government agencies, and a myriad of other work environments. They may even start their own business. The curriculum totals 67 credit hours with courses in payroll accounting, individual income taxes, and business law to name a few. The program's degree plan includes a number of professional electives for added flexibility. Students even have the option to turn their work experience into degree credits. The school administers courses through Moodle and prices tuition at a per semester rate for both in-state and out-of-state students. Located in Lynchburg, Virginia, Liberty University was established in 1971 and today stands as the fifth largest university in the United States. Liberty offers a comprehensive list of academic degree programs, including an associates of arts in accounting for distance learners. Designed to develop technological and communication skills in addition to fundamental knowledge in accounting and related areas, Liberty’s program prepares students for work following graduation or a bachelor of science program, which the school also offers online. Of the 60 credit hours needed to graduate, 21 credits are required for the major and only 15 must be taken through the school, providing a level of flexibility that in part makes this one of the best online associate in accounting programs in the country. In addition to previous college-level work, students can also gain credits towards their degree through examination, military or professional training, life or work experience, and by way of several other means. Regardless of where they may live, the school's tuition rate is per credit and fixed for all students. Foothill College, located in Los Altos Hills, California, opened the doors to its first cohort in 1958. Today the school enrolls approximately 17,500 students annually and offers 79 two-year academic programs, including an online associates degree in accounting. Whether a student desires to transfer to a four-year institution, to take the CPA accreditation exam, or to immediately find employment, this program trains goal-driven learners to become effective decision makers and financial analysts. Consisting of 90 credit units (or 60 traditional hours), students take core courses in topics that include financial accounting, business law, and tax auditing, all the while becoming familiar with the field's most popular programs and tools. Learners may also complete general education requirements online but offerings change each semester, so students who wish to complete their entire associate of arts online should carefully plan their degree in consultation with an academic adviser. Foothill prices tuition per unit and online students enjoy a number of student services, including online tutoring through the Teaching and Learning Center and STEM Success Center. Located in the city of Rome, Georgia Northwestern Technical College was formally created in 2008 through the merger of two nearby vocational schools. Today, GNTC offers accessible and student-oriented academic programs, including an associate of applied science degree for distance learners. Designed with the goal of career-placement in mind, this program prepares students for accounting work in today’s technologically intensive workplace through courses on topics such as computerized applications, spreadsheet production and analysis, and payroll accounting. Students must complete a minimum of 64 credit hours to graduate: 15 in general education classes, 31 in required occupational coursework, and 18 in electives (which learners can use to create a specialization area). GNTC prides itself on building mutually-beneficial relationships with local and national business, and students may take advantage of the school’s connections to gain internship opportunities or jobs. GNTC also boasts one of the country's best online associate in accounting programs in terms of cost, with exceptionally cheap tuition rates for Georgia residents and out-of-state citizens. Based in Marion, Indiana Wesleyan University offers more than 80 undergraduate degree programs and enrolls over 10,000 nontraditional students through its various education centers in Indiana, Kentucky, and Ohio, and through its distance education platform. IWU’s online associates degree in accounting focuses on ethical decision-making in addition to competency in fundamental accounting and business principles and skills. The curriculum totals 60 credit hours and, similar to other programs of its kind, consists of general education and major coursework in topics like the legal environment of business, spreadsheets in accounting, and payroll and taxation. Students take courses in a sequence (one at a time) and usually earn their degree in around 26 months. The school conducts classes via a cohort model where students take courses with the same group of students throughout their degree experience, enabling them to gain support and build professional relationships. Online tuition is affordable and the school charges all students, in state or out, the same rate. Highland Community College traces its history back to 1858, making it the first college in Kansas. Today the school enrolls 3,200 learners annually on its main campus, regional education centers, and online. HCC’s associate of applied science in accounting is designed for individuals who want to gain job opportunities in the general field or related areas of financial maintenance and reporting. The degree plan consists of 63 credit hours in general education and degree requirements, with courses in business communications and managerial accounting, to name a couple of examples. Over a third of the curriculum for this online associates degree in accounting can be fulfilled through electives, enabling students to specialize in topics that will be most beneficial to their future careers. Courses are facilitated through the Moodle platform and tuition is priced at the same cheap rate for all United States citizens. HCC makes financial assistance is available, including regional awards and scholarships specifically allocated to business and accounting students. Located in Troy, New York, Hudson Valley Community College serves over 13,000 students annually and offers 25 degree and certificate program through its distance education format. Included in this catalog is an online associates degree in accounting designed for individuals who wish to enter the workforce immediately after graduation, though HVCC does have articulation agreements with several universities for those who want to pursue further higher education. Through a combination of core business topics and coursework in specialized fields of accounting like computerized systems, federal income tax, and advanced bookkeeping applications, students not only learn principles and theories but also ways to apply them to real business scenarios. Students must complete at least 62 credit hours in order to earn their associate of applied science degree. The school conducts online classes asynchronously and exams are proctored by an external service in the student’s location. Students can pay tuition per semester with full-time status or per credit part-time, and HVCC makes a number of institutional scholarships available to incoming and current students. Northwest Iowa Community College, located in Sheldon, was organized in 1966 and today offers 43 job-training, certificate, and degree programs. Many of these are offered through NWICC’s distance learning platform, including an associate of applied science in accounting. Designed to prepare students for entry-level careers in bookkeeping and general accountancy, the curriculum totals 63 credit hours and includes coursework in principles of management, cost accounting, and advanced spreadsheet applications, to name a few. NWICC administers courses asynchronously and divides them into lecture and lab-style learning styles, enabling students to familiarize themselves with all aspects of the accounting cycle through theoretical understanding and practical application. Full-time students enter the program in the fall semester, while part-time students may enter during any term. NWICC offers an affordable tuition rate for all online students regardless of residency status and scholarships are available through the college’s foundation. Distance learners also benefit from NWICC’s students services, which includes academic advising, counseling, career placement assistance, and tutoring through the Learning Center. Fort Lauderdale's Keiser University was founded in 1977 with the mission of serving adult learners through accessible and career-focused education. To this end, Keiser offers a number of nontraditional academic degree programs, including an online associates degree in accounting. Designed to provide fundamental knowledge and skills needed for students to gain entry-level positions as bookkeepers and financial assistants, the curriculum totals 60 credit hours. 36 of these hours consist of lower division general education classes and 24 consist of major coursework. Courses examine topics such as principles of taxation, financial management, and integrated accounting. Students gain sought-after technological skills in data analysis and document preparation that enables them to assist in a business’s decision making process. Keiser’s tuition rate is priced per semester for full-time enrollment, though students who wish to attend part-time can pay based on per-credit calculations at the beginning of each semester. A flexible transfer policy allows students to receive credit for previous college work, life and work experience, and military training.